This was the product or our GRAND morning in the snow yesterday. 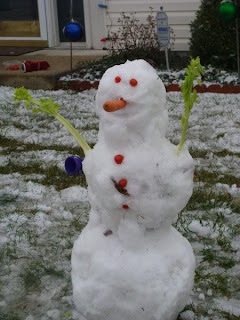 I thought it was pretty creative to use celery for arms. We tried to use olives for eyes but Baboo kept eating them, so we ended up with grape tomatoes. There's nothing quite so exciting at the season's first snow-person. Yesterday Mouse asked for a hot dog for breakfast. As soon as Baboo heard the word “hot dog” she started yelling “Hot dog! Hot dog!” So, being the good mother that I am, the girls had hot dogs WITH ketchup for breakfast. I was happy that they were both eating SOMETHING and well, hotdogs are a type of sausage right? RIGHT? Baboo said “Nummy Mommy! Nummy Daddy!” as she dugs into her hot dog. Oy. She also had 1.5 bananas , as well. I guess she was hungry for things “tube shaped”. Weird.